This citrus fruit closely resembles an orange, and are the size of a large olive. Eaten worldwide, this fruit originates in South Asia and the Asia-Pacific region, and is currently cultivated in China, Nepal, the Middle East, Europe and the warmer parts of the U.S. like Florida and Hawaii. Kumquats have a very short growing season, so catch them while you can! The annual Kumquat Festival held in Dade City, Florida attracts 40,000 people every year with its exploration of the vast uses of kumquats in recipes ranging from cookies, smoothies, ice cream, juices, liqueurs, marmalades and kumquat salsas. Our own take on the kumquat can be found in our online store with our Kumquat Tartlet dessert-kit. 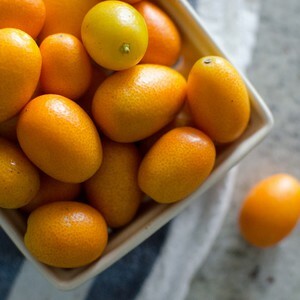 Here, the kumquat incites various senses with its tangy taste, warm hue, and tart aroma.